The much acclaimed monster truck is actually based on simple technology and is not much different from the main technology on which the regular pick up trucks are built. These trucks come with four wheel drive so that driver can have complete control over the truck which is placed on much bigger wheels than a regular pick up truck and also is much heavier. when the first monster truck was made there were no such technologies and the initial trucks where heavy iron models placed on heavy wheels. As technology improved in the automobile industry it was instantly adapted to create monster trucks which can be better in performance on the game grounds. The modern monster truck techno logy comes with the four wheel drive and with fiber glass bodies. They have a tubular chassis and four link suspensions for all the wheels giving them the ability of complete motion. The engines are mounted right behind the driver’s seat on the top. These engines are already supercharged and run on alcohol. They have axes similar to the buses and also come with hydraulic steering. All the current technologies like automatic transmission, torque converters. however in the monster truck the main front wheels are controlled by the steering wheel and the rear wheels are controlled by toggle switch. Any of these technologies have been customize to work with the monster truck for a full performance ration. The fact that monster truck racing can be dangerous cannot be written of and that is why there is several safety features included as a part of the technology. In case of a roll over or a complete topple all the power systems have been designed for self shut off. 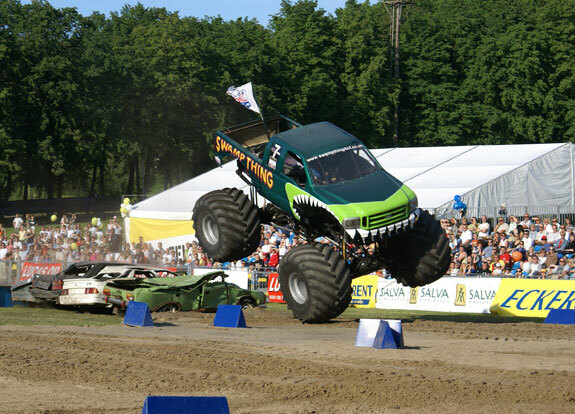 A monster truck is an extremely powerful and a bulky vehicle in the end. It also goes at a considerable speed and at the top speeds due to the size and weight of the vehicle even a small scale mishap can cause severe damage. To avoid these kinds of situations some technologies like power shut off have been designed. Weight also gives the truck more balance so in case of a shut off the truck can actually handle itself well. 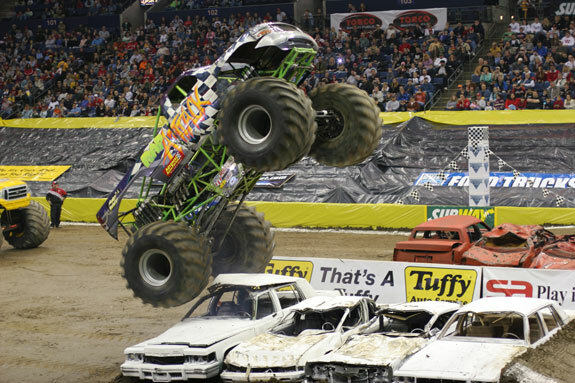 The monster truck technology also includes protective shields which in case of explosion will keep the driver safe. The driver sits behind the shields which are protecting him against all fire hazards and other dangers. The driver seat is located in the middle of the truck to increase the visibility. Actually when the driver is seated inside the truck everything like the cars to be crushed looks tiny. The heights of these trucks make it difficult for the driver to see clearly as to what is beneath the wheels and mirrors do not help in this case. When the driver is seated right at the middle the visibility is clearer and the driver can get a clear view of what is on either side of the truck wheels. Today monster truck racing is much safer then what it was initially.